Like some of you out there, I have a lot of music on old vinyl LPs. I'm assuming that even if some of you have never seen an LP, you know what it is. 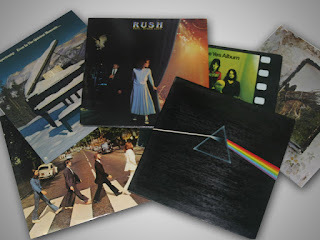 LPs were albums or "Long Play" plastic discs. These discs had grooves that a needle would follow. The needle would pick up vibrations in the groove and convert those vibrations into sound. In those days my strategy was to purchase music on LPs and play them once when I recorded them to cassette tape. I would put the LPs away and always listen to the music off tape, whether it was in the car stereo, a Walkman or from a Boombox. Even now, my LPs are still in pristine shape. Now that cassette tapes have faded off to technology heaven and MP3 players like the Apple iPod have taken over, I've started to convert my LPs to digital files so that I can add them to my Apple iTunes library. Being that this is a DV Fanatics blog, I'm assuming most of you have a analog to digital converter. I use a turntable connected to my old Avid Media Composer Meridien system. For those of you who do all their video completely in the digital realm and have never had to deal with analog sources, there are some solutions for you too. If it's not already built into your computer, you can get an analog to digital converter relatively cheaply. I have a Sony DVMC-DA2 Media Converter that I've never had any problems with. Unfortunately, I don't think Sony makes it anymore. After a quick search, I found the ION Video 2 PC from Ion Audio. I've never tried the ION Video 2 PC, so you're on your own. My process is to capture an entire side of the record as a single file then export it out as AIFF. Then open the AIFF file in an audio editing application such as Adobe Audition or Apple Soundtrack Pro. Adobe Audition has a feature that comes in very handy when converting a vinyl record to audio file - Automatic Click Remover. This feature can be found in Effects > Noise Reduction / Restoration > Automatic Click Remover (I just use the default settings). Once the AIFF is clean, it's time to split the file into its individual songs. When saving out the individual songs, it's best to name them by track number and song name - "01_first_song_name.aif". This will allow you to sort them in the correct order once they're in iTunes. After all the songs from both sides of the record have been exported as individual songs, it's time to import them into iTunes. I'm on a Mac, so I usually do this by dragging all of them to the iTunes application icon in the Dock. This will open iTunes and import them into your library - make sure "Copy files to iTune Media folder when adding to library" is selected under "Advanced Preferences" in iTunes. This will copy the files rather than just add them to the library from their current location. Once all the songs are added to iTunes, It's time to rename the tracks and add the other metadata that iTunes uses. If you can't find the newly added songs, go to the "Recently Added" Smart Playlist. The newly added songs should be at the top of the list. Selecting the song or songs and pressing Command-I will bring up the information window. It is here that you can add the Artist, Album, Genre, Year, Track Number and even any album Artwork that you may have. Now the treasured music from you vinyl collection can be enjoyed on your iPod or iPhone.